An RV combines all of the benefits of a mobile home with the opportunity to travel and explore new places daily. While conveniences like power and water have evolved to the point where they're as reliable as being at home, phone service can still be unreliable. Unfortunately there's no surefire way to have perfect service in absolutely every place you travel, but a cell phone signal booster for your RV can significantly increase the likelihood that you'll have usable signal while you're in transit and/or parked for the night. 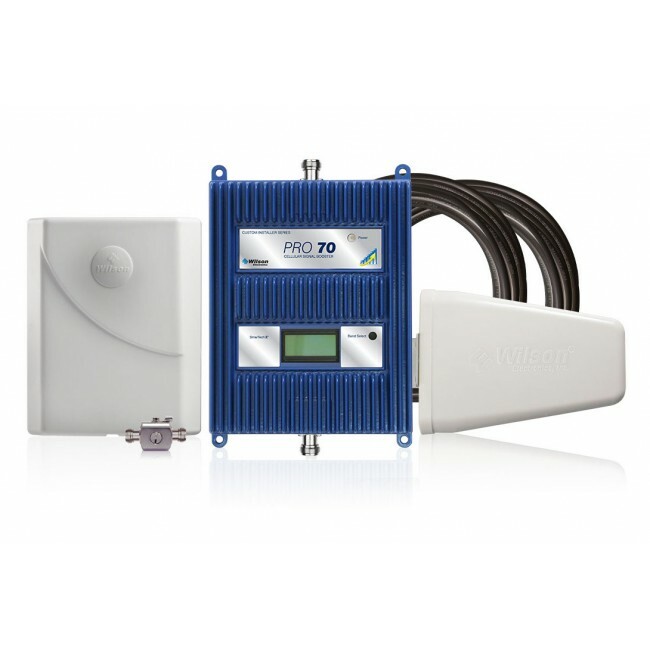 What is an RV Cell Phone Signal Booster? 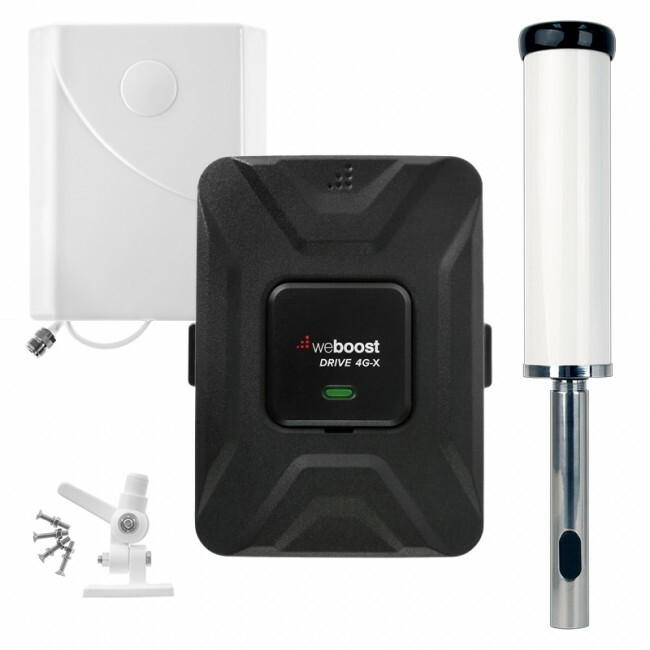 An RV cell phone signal booster is a system that receives the existing outside cell signal, passes it through a signal amplifier inside of the vehicle, and then broadcasts the boosted signal to an area within the RV. An RV signal booster typically consists of an outside antenna, a signal amplifier, an inside antenna, and low loss cable to connect all of the components together. The outside antenna is usually mounted to the roof or back ladder of the RV, and then connected to the signal amplifier with a cable. The signal amplifier is located within the RV and is connected to the inside antenna by a low loss cable, which is mounted in the area of the RV where you need better signal. There are two main types of RV cell phone signal boosters: For use while moving AND parked and for use ONLY while parked. Each type of booster system has pros and cons, so you'll need to figure out which one is going to be best for your typical usage. If you're looking to use your cell phone signal booster while driving between campsites as well as when parked, then you'll want the Drive 4G-X Extreme RV Signal Booster Kit. 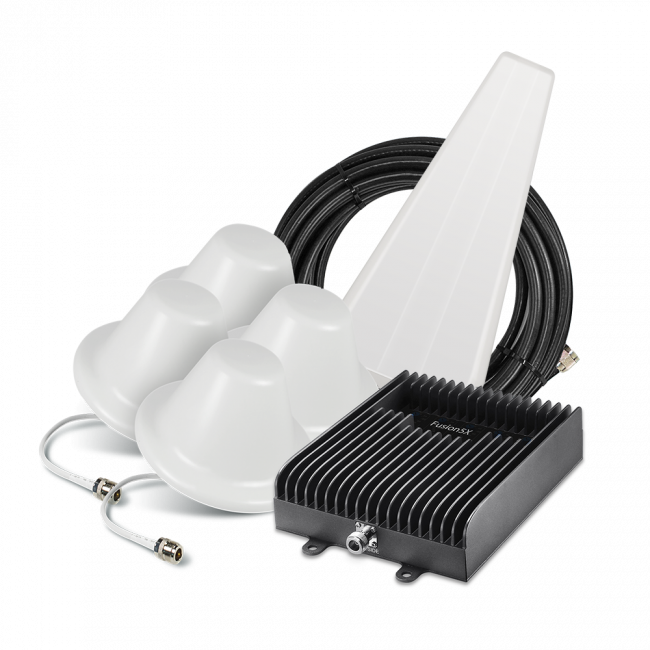 It is the most versatile RV booster kit available, boosts all networks on all carriers in North America, and will allow you to be as far as possible from the cell towers while still receiving boosted cell signal. There is no manual adjustment needed while driving or parked, the booster will automatically adjust itself and boost signal as long as it can receive some signal in the outside antenna. 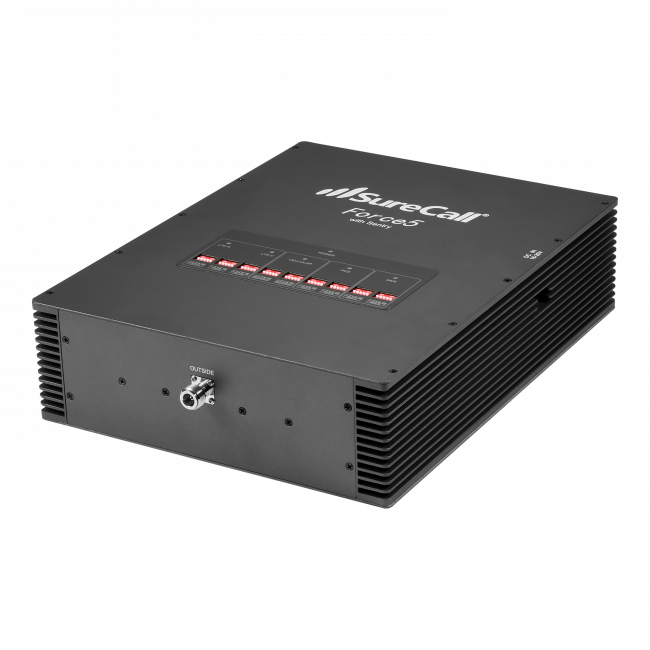 Since the Drive 4G-X Extreme RV Kit is designed to boost your cell signal while both moving and stopped, the FCC limits the overall boosting power of the amplifier, so the booster is not able to create as large of a coverage area as if it were a building booster. Depending on the strength of the existing outside signal, the coverage area can be between 6 ft from the inside antenna for a strong outside signal, down to about 12 inches if the outside signal is very weak. If you want to boost signal while moving AND parked, don't need a huge coverage area, and want to be as far from the cell towers as possible, then the Drive 4G-X Extreme RV kit is the right option for you. The FCC limits the boosting power of any cell phone signal booster that is used while in motion, such as in a car, truck or RV, so the inside coverage area that you'll get from that type of system is going to be much smaller than what you'll receive from a booster designed for use while parked. If you plan to only use your signal booster once you arrive at your campsite, and want a larger coverage area inside than just a few feet from the inside antenna, then one of the following kits are going to be the best option for you. Omni Outside Antenna (no setup required at campsite) - If you're looking to pull into the campsite and plug in the booster, then the eqo RV Signal Booster Kit is going to be the best option for you. It uses a permanently mounted omnidirectional outside antenna on the back of the RV to receive the outside signal, so no aiming or setup is required, and you can automatically start boosting signal when you arrive at the campsite. Directional Outside Antenna (some setup required, but stronger type of antenna) - If you're ok with spending a few minutes to setup the outside antenna when you arrive at the campsite, then the weBoost eqo Signal Booster Kit with the Add-On External Yagi Antenna Kit is going to be the best option for you. While it may take longer to setup, the yagi directional outside antenna is going to be the most powerful type of outside antenna available, so you'll be able to receive weaker outside cell signal and create a larger coverage area inside with this setup. Please note, you'll need to mount the outside antenna on a telescoping pole of some sort (not included with the kit), in order to raise the antenna up and rotate it, so that will need to be purchased separately. While these kit options should work for most situations you'll find while RVing, if you need a special setup or have any additional questions, please do not hesitate to contact us. Our experts can help you select the right booster for your situation or troubleshoot your existing setup over the phone. Following our recent retirement my husband and I recently purchased a 25 foot RV. We both have IPhones and IPads and we subscribe to Xfinity Cable which provides outstanding programming that includes on demand movies and TV programs. Based on the fact that we have loaded Xfinity to our IPhones and receive a flawless signal we were wondering if we could feed the TV signal via WiFi thru our RV stereo with help from the RV Signal Booster Kit? This should drastically improve TV reception in the. RV especially on the road traveling and eliminate the need to purchase a costly roof mounted Satellite receiver because as we all know an RV TV Antenna is basically worthless! Hello, the RV signal booster kit will dramatically improve the cellular signal which you're streaming movies and TV programs over, but it won't help you pipe audio into the RV Stereo. Hope that helps!